Work has been a little crazy over the last few days and I have not had a chance to post my thoughts on this blog as planned. Which is annoying, as I have a number of things I want to wax lyrical about! Amongst other things, the new release from Panini (2011-12 Past & Present Basketball), sticker autographs, my recent experiences on selling some cards on eBay and as well as my conclusions as to the direction I plan to take my collection are all rattling around in my head! But that will have to wait for a few days...but, in the interim, I had to share the above small addition to my collection, that arrived in the mail today. 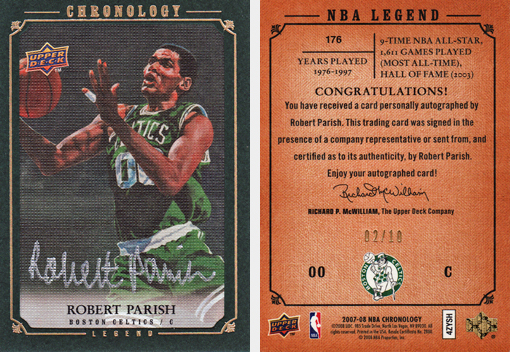 It comes from one of the best releases from the last few years (2007-08 Chronology) and is a superb looking canvas autograph card of Hall of Fame inductee Robert Parish. Great card. I want the black bordered version numbered /99 for my collection. Let me know if you see one for sale!